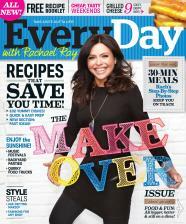 The Associated Press discusses the recent makeover of Rachael Ray's magazine, Every Day with Rachael Ray . I love the bright, clean look of the makeover, but I sort of felt overwhelmed by how much content was crammed on to some of the pages. I would rather have a few great recipes than a million little tips and recipes. What do you think of the new look? Do you miss the celebrity fridge? I have to say - I was excited about the make-over then I got the issue... I agree it is a bit over whelming - Way too much stuff on every page and a bit too much information. I did like the sketches of Rach and other writers. But I think they need to tone it back some. It's like some one threw up on every page.